Green, lean and packed with energy! This is one of my favorite ways to start the day – keeps my mind clear and gives me great motivation and energy! I have a Jack Lalane juicer, but I’ve never quite mastered the whole juicing thing. It’s messy, time consuming and typically not worth the hassle, but I love starting my day with a healthy juice or smoothie. So while I wish I could be like so many of you out there who wake up daily and juice your way to a clear day, I just can’t seem to be that girl. But I can be the girl who pops into the local Juiceland or Juicebox and let them help me start my day in a healthy way! For those days when I’m more motivated or have more time, I whip up this quick and simple green juice smoothie and head off for my day with a healthy immune booster. 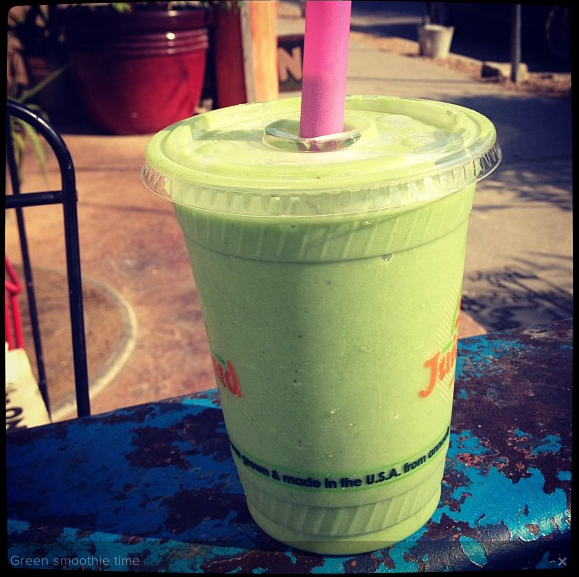 There are tons of variations to a green juice/smoothie, but this is a favorite of mine. Blend all ingredients together in your favorite mixer and enjoy! Note: I like to start with the greens and liquid of choice first to make sure they are properly blended before I add all other ingredients. My other favorite version: use bananas & strawberries as your fruit and substitute ¼ cup of almond butter or Sunbutter in place of the avocado. 1 Pings/Trackbacks for "Green breakfast smoothie"